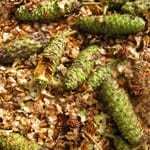 Downy birch is a pioneer tree. That means it is one of the first trees to colonise new (or cleared) land. Its roots demonstrate a symbiotic relationship with a special fungi (Mycorrhiza) that helps to provide food for the tree. The downy birch has oval leaves that are rounded or triangular at the base. The edge of the leaf is coarsely toothed. 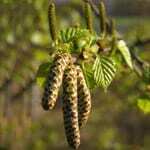 Downy birch has both male and female flowers (catkins) on the same tree. 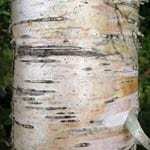 The bark is greyish-white (not unlike the silver birch) and has horizontal grooves. 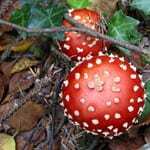 It contains a chemical called Betulin that gives it the white colour. The young twigs are characteristically hairy, which is where the tree earns its name. The fine hairs give the twigs a soft edge, especially when seen with the light behind them. 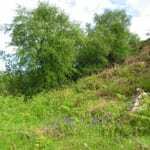 Downy birch is the most commonly seen birch in Northern Ireland. 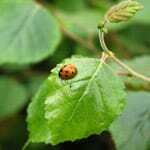 It tolerates the cold well and thrives in damp soil, often peaty and acidic. Areas of poor soil are quickly colonised by this tree. As successive generations live, shed leaves and die, a richer soil underneath the trees builds up. This makes it possible for other, more demanding trees to move in. These may eventually overshadow the downy birch and replace it as the dominant tree. This is how north-western Europe was recolonised by trees following the end of the last ice age 12,000 years ago.